Is it affect or effect? Lay of the land or lie of the land? Learned or learnt, or are both acceptable? Wreak havoc or wreck havoc or work havoc? Must you rely on a search engine and website of unknown repute to find out? As you've probably guessed from the title of the post and the image, what you need to answer these questions is a usage guide. Dictionaries tell you how to spell a word and what part of speech a word is, but they don't discuss the specifics of its usage in Standard English. That's where usage guides (like Garner's Modern English Usage) come into play. They help you avoid those common errors and misspellings and differentiate between true Standard English and the version fraught with superstitions and errors. It would tell you, for instance, that despite what your high school English teacher may have taught, it's perfectly acceptable to start a sentence with and or but. It would tell you that for learned and learnt, learned is the American English choice, but that learnt is also used in British English. Using learnt in American English would be an affectation. However, it would tell you that leapt and leaped are both "acceptable past-tense and past-participial forms for the verb leap," but to watch out for the incorrect lept. Leaped is the more common American English version, though. 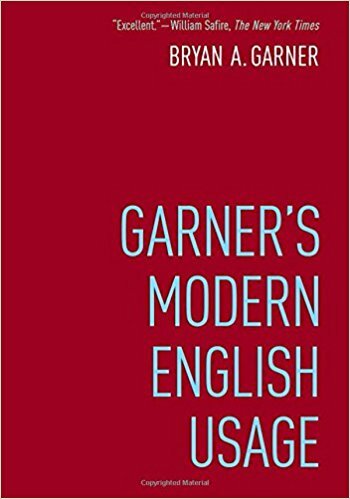 And ... well, there are numerous other interesting and useful things to be found in Garner's Modern English Usage. 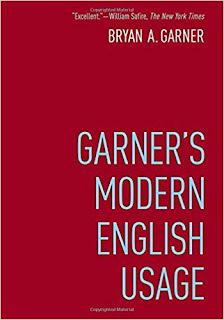 I'm finishing the last of four courses for a copyediting certificate, and one of reference books we're using is Garner's Modern English Usage. If you're serious about using exactly the right word, or want to know which "rules" are really superstition, or want to know what zombie nouns are so you can avoid them, and so on, then this is a good book to add to your library. Have you ever used a usage guide? Are there any commonly misused words or phrases that you have trouble with, or that are a pet peeve when someone else uses them? This looks fun! I think I will have to pick up a copy for my classroom, as well for me! Thanks, Lizzie! I'm glad the information was useful! That's a good one. I must remember to use it properly! Thanks for sharing this, Lizzie! Sounds like a good one!